I bloody warned you EA but you wouldn’t listen. My thread is still up over on General Discussion (yes, I’m as surprised as you are) and both Mac and Windows users are posting on it. Thank you to The Mare’s Nest for their fab post last night bringing more attention to EA’s pile of steaming crap Customer Support and shoddy products. 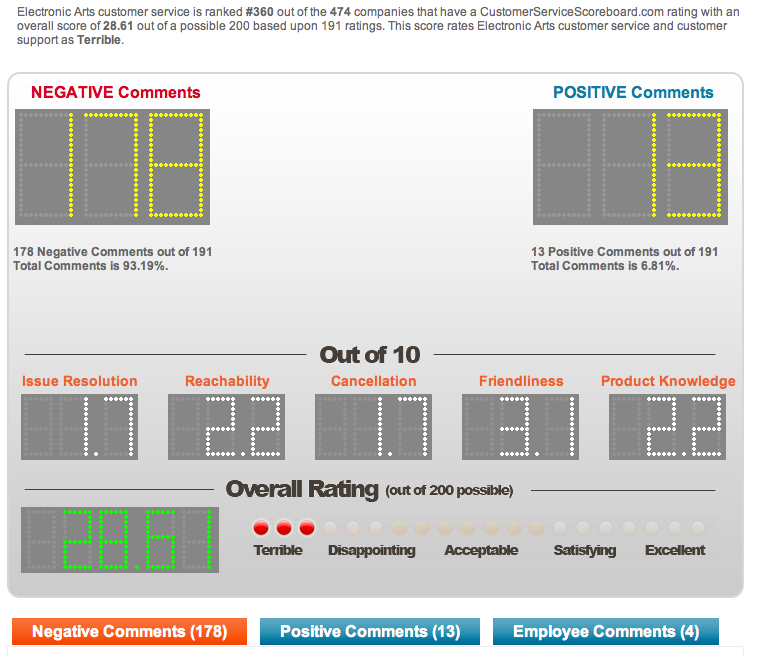 The Customer Service website I linked to in my forum post has had quite a jump in comments too. Before I posted the link I think EA were at number 297ish out of 474 companies. They’ve subsequently dropped down to 360. There were 132 negative posts, 13 positive ones and 4 EA employee ones (2 from the same person). There are now 178 negative posts, 13 positive and 4 EA employee ones (again, 2 from the same person). Moving that thread over to General Discussion sure did wonders for your image EA. Genius. What hope is there, really? I received responses from EA and Transgaming to my emails to them, asking for screenshots and tech. specs, yawn. Of course, I haven’t received a reply since sending them everything they asked for. Next Positive feedback from EA? I really hope so. A “knew” data system… LOL. And they admit to having minimal training? Good god, I am absolutely speechless – what hope is there for anybody, with CS like that? Some of the issues require nothing more than a little common sense to fix – obviously they aren’t “trained” in that area. You have to laugh or you’d cry. “We are doing hard”? “We are 100 of scam persons”? The mind boggles.